When Army Veteran Sam O'Neil returned to America after a harrowing stint in Iraq, he had a difficult time adjusting to life as a civilian. O'Neil, a father of three, eventually found himself short on cash and without a car, a serious obstacle in his rural hometown of Sunizona, Ariz.
"It's a beautiful car," O'Neil said recently of the black 2015 Nissan Sentra. "I was excited. My kids were excited. [My] mom and dad were going crazy." "Most of us take having a car for granted, but for those without reliable transportation, everyday [chores] are challenging and stressful," says Joe Lacy, chairman of the program and a director at GEICO. "A vehicle represents hope [and] independence," helping families get back on track, he says. 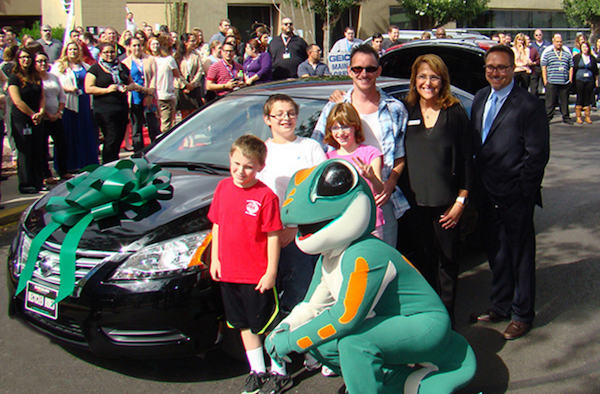 GEICO has been involved with the program since its inception, and in 2015 alone donated 47 cars. Lacy says Recycled Rides, which has gifted more than $13 million worth of vehicles, is an important part of the company's efforts to make life better for Veterans and disadvantaged families. "It is important that we support the communities we live and work in," says Lacy. "This is an all-volunteer group and we do this because it's the right thing to do." O'Neil can attest to the importance of those efforts. Without a car he couldn't get to appointments at the nearest Veteran's Affairs hospital, more than 100 miles away. He relied on his parents to take him grocery shopping. And he struggled to find things to do with his three kids in Sunizona, a small town about 110 miles from Tucson. "There is a gas station, a laundromat and a community center," he says. "There is no public transit." He's now able to make his doctor's appointments and take his kids on regular outings to Tucson. He's even considering going back to school. "Thank you," he says when asked if there's anything he'd like to say to the people behind the program. "The car's still doing great." GEICO doesn't just work to get vehicles to families in need. We're also helping individuals get back on the road after being involved in accidents. Find out how in our Putting Patients Back in the Driver's Seat story.